As one of the four major annual golf tournaments, the US Masters is a popular betting option for American gamblers. As the only tournament with a permanent venue, it’s also easy to watch live. Every year, golfers from across the world gather in Augusta, Georgia. During the first full week of April, all eyes are on the first possible winner of the season. 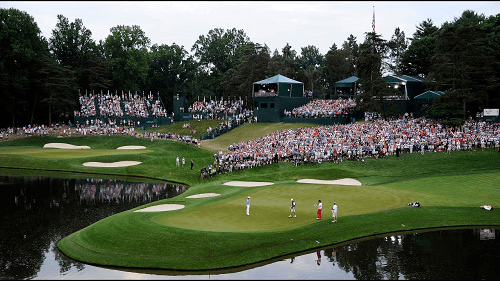 While we may not win the US Masters, it’s easy to win bets on the tournament with our recommended bookies. However, we advise caution when betting, because there are no guaranteed winners in golf. Even Tiger Woods has never managed to win more than two years in a row. So, keep updated on the handicaps and gameplay on your favorite sports betting site. After all, an educated gambler has a better chance of winning some cash. There’s no reward without a risk, especially when betting on the US Masters. Still, biding your time throughout the week is always the safest risk. Nowadays, the PGA Tour is fairly unpredictable because of the standard of players. To ensure that you place the best bet, we recommend keeping an eye on tournaments before the April event. Specifically, the World Golf Championships in March are a great precursor for overall play. Statistically, players who do well in the WGC usually do the same in the US Masters. Betting outright on the winner will still be risky, but guesses and gambles go hand in hand. The problem with betting on golf is that there are no guarantees. No matter how well a player is doing, there’s always a chance of a loss. For that reason, predictions and futures betting are pretty difficult. Still, you can try to research players and compare previous years for a better guess. Keep visiting Gambling 360 to get the latest odds for the US Masters and other golf championships.